"In our day in Hollywood, the monsters didn't need makeup...they just came as themselves." During the 1960s and early 70s, American horror was arguably synonymous with two names: Vincent Price and American International Pictures. Starring in a slew of horror films for AIP (most notably the Roger Corman produced Poe adaptations), Price would go on to become veritable legend in the field of horror. Of course, AIP's British counterpart at this time was Hammer Productions, spearheaded most notably by Peter Cushing and Christopher Lee. However, by 1974, Hammer's dominance over the horror world had begun to wane due to the company's increasing financial woes. This left Amicus Productions (many of which prominently featured Hammer alum Peter Cushing) to fill the void, and 1974's Madhouse represented a strange convergence of this era of horror. A co-production between Amicus and AIP featuring Price, Cushing, Robert Quarry, and even Boris Karloff (in archive footage), the film would end up being the last that Price would make for AIP; it also would hang on the precipice of the new era of horror that would be unleashed by The Exorcist, which would result in the B-movie features of the 60s and 70s falling out of favor with audiences. In the film, Price plays the rather familiar role of Paul Toombes, a horror actor whose signature role is Dr. Death, a character co-created by writer Herbert Flay (Cushing). At the begining of the film, friends are gathered to celebrate the actor's career, while Toombes himself has decided to settle down with his fiance, Ellen; however, the night ends in tragedy, as Toombes finds Ellen beheaded. Though never convicted of the crime, Toombes was put into an insane asylum and his career ruined. 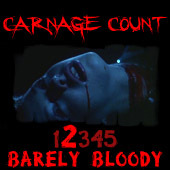 Twelve years later, Herbert convinces Toombes to resurrect the seminal character for a new television series; however, before long, tragedy begins to strike, and the body count begins to rise, leaving Toombes to question his own sanity and others to wonder if Toombes is enacting the events of his films in real life. Though it came in during the tail-end of this era of horror, Madhouse stands as a fine example of the 60s-70s features of the time. It's slick, stylish, and it goes without saying that the acting is top-notch, as both Price and Cushing turn in excellent performances. Price's would-be AIP successor, Robert Quarry, also features prominently in the role of the producer of the new Dr. Death series. Visually speaking, the film is very striking, and looks very much like the other lush productions from AIP during this era. If there's one thing I miss from the Hammer/AIP/Amicus era (besides the British babes), it's the color-saturated looks of the films, and Madhouse is very much in this tradition. Story-wise, the film is tightly constructed and features a fair amount of red herrings before culminating in a twist that is both shocking and sensible. I have seen the film's ending come under a fair amount of criticism, and I do think it's a bit of a head-scratcher. Suffice to say, the film takes a pretty hard left turn in the final five minutes or so, but I don't think it sinks the ship completely. It does weaken the film a bit, if only because I'm not sure how we're supposed to swallow at least one aspect of the ending. The strength of the story is actually the "fictional" character of Dr. Death himself, which features one of the coolest make-up jobs and costumes in horror history. The character feels very gothic and vintage, despite only being 35 years old now. Other than this, there's very little wrong with Madhouse. It's odd how prophetic and valedictory the film ended up being, as I don't think anyone at the time could have guessed that this era of horror would soon be ending. Indeed, there's one scene that features some clips from Toombes's more famous films, which end up being some of Price's own notable AIP films, like The Pit and the Pendulum and The Raven. It's almost as if Price is playing himself and bidding farewell to the AIP era. On top of this, the film represents a sort of crossroads of horror, as it features its distant past in Karloff's brief "cameo," its present in Cushing and Price, and its would-be future in Robert Quarry, who was being groomed as Price's successor for AIP. There's actually one sequence in the film where all three men are at a costume party. Price is dressed in his Dr. Death regalia, Quarry wears his costume from Count Yorga, and, ironically, Cushing is decked out as his perennial Hammer arch-nemesis, Count Dracula. It's quite an interesting scene for the observant horror fan, and it speaks for the film's somewhat meta-fictional nature as a whole. While it might not be as deep or introspective as other self-reflexive horror films like Wes Craven's New Nightmare or A Cat in the Brain, the film nonetheless has a bit to say about the function of horror films in society. Toombes himself claims that horror films serve as a medium for all the unspoken and latent, violent desires to be acted out where they are otherwise suppressed. This of course has immediate relevance within the film, as it would seem that the fictional violence perpetrated by Dr. Death isn't enough for at least one character. On the subject of violence, it's interesting that this film is rated PG, despite featuring a decapitation and a couple being skewered together on a sword. As such, it's not a very bloody or gruesome film, but it does feel a bit violent. All told, Madhouse seems to be a bit of a forgotten gem in the AIP/Price cycle for whatever reason. It certainly doesn't represent the best of either party, but it is certainly an excellent horror film that oozes atmosphere and features a memorable character in Dr. Death. The film can be found in two iterations: as part of a Midnite Movies double feature along with Theater of Blood, or as part of MGM's Vincent Price Scream Legends Collection. The discs are identical and unfortunately feature a non-anamorphic trailer, though the mono soundtrack is crisp and clear. There are no special features on the disc itself, but the Price Collection comes with an entire bonus disc full of extras. I'd like to see MGM revisit this one in the future and give it an anamorphic upgrade, but the Price collection is a nice package for the time being and relatively cheap considering you get 7 classic films. At any rate, this film itself is one of my favorite films from this era, and it's certainly one Madhouse that's worth being locked up in for 90 minutes. Buy it!